Three photographs of 4th of July celebrations in Alma, Kansas. 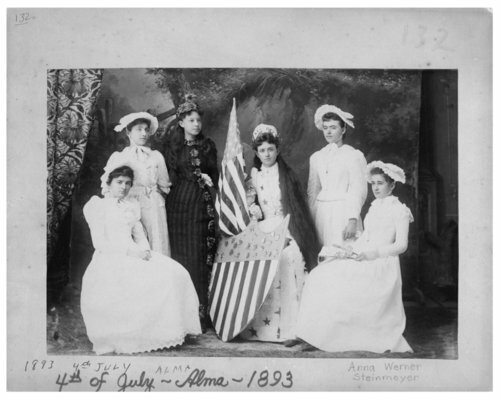 In the first photograph, six girls in patriotic dress pose during Alma's 1893 4th of July festivities. The second photograph captures the 1893 4th of July parade from the balcony of the Alma Hotel as it proceeds north on Missouri Street. In the third photograph, children dressed in patriotic clothes pose on a float constructed in a wagon in this view from the 1894 Alma 4th of July parade.